One of the most intimidating things I can think of would be to write a poem and then read it to a group of strangers. It makes my heart race just to think about it. That’s why it’s so amazing to me that the talented staff and volunteers at WriteMemphis can convince teenagers to do that within the first 10 minutes. When I asked Emma Connolly, the Director of WriteMemphis, about the purpose of their work, she said their goal is “to help inner city Memphians claim their voices through the power of creative writing. The process and method we use affirms every participant’s creative voice, and urges them to write their own story, explore their true self. Our method and writing prompts encourage writers to increase vocabulary and understand the breadth of words. We believe in ‘doing with’, not ‘doing for’.” This approach was clear and evidence in each of the two WriteMemphis events I experienced. I attended a Poetry Slam at the Central Library and facilitator Troy Wiggins greeted me at the door. He explained that they “want students to create new work using their own unique voice – a voice that is often suppressed in other parts of their lives.” We talked at length about the value of helping students believe that their voice and their ideas are important. For these students, writing is a very powerful tool. I have never taken a creative writing or poetry class and the terms that were foreign to me (like “writing prompt”) seemed to be routine for the students. During the meeting, we watched a short documentary called “As I Am“, which is narrated by Chris Dean. For those of you who don’t recognize his name, Chris Dean was the Valedictorian of Booker T. Washington High School and had the honor of introducing President Obama during his visit to Memphis. The video is a gritty look at a part of Memphis that most of us never see. It was meant to get the students talking and writing. It worked. I was impressed with how quickly they shared their stories. After each person spoke, Troy would moderate the discussion and give feedback. Troy quickly impressed me with his quick and specific insight about each piece. Each time someone shared, I would still be processing what I’d heard, but Troy could immediately begin describing how it the piece resonated with him. It’s obvious that he loves this work and it has an impact on the students At the first meeting, they had two students and that quickly grew to 32! They seem to have leveled off with 11 dedicated students each week. I can’t wait to see what they write this month. I also spent some time at the South Memphis Story Gathering project. This project gives students the opportunity to interview life-long residents of South Memphis and to document those stories in their own way. They students are not only responsible for writing the story, but they also created their own interview questions and conducted the interviews themselves. While this is teaching students invaluable writing skills, it’s also teaching them the skills they’ll need to connect with others in the world. But best of all, I love that the students were surprised and intrigued by the people they interviewed. 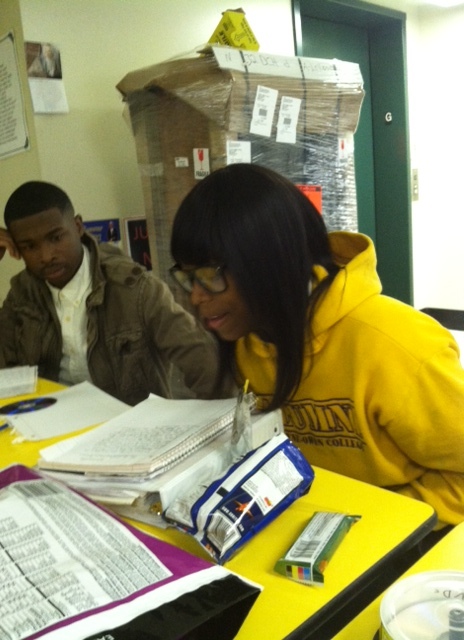 One of the girls, Markia, told me that she was supposed to interview “Mrs. B” but Mrs. B “always looks very busy”. I’ve never met the lady Markia described, but the others in the grouped gave enthusiastic nods at this description. Markia worried that Mrs. B would be disinterested or too busy to talk, but instead found just the opposite: Mrs. B went into great detail describing a chocolate checkerboard cake from her childhood, which became the centerpiece of Markia’s story. I asked another student named Dennis about his interview experience and whether he had to ask a lot of questions in order to generate conversation. Before I could finish asking, Dennis was already shaking his head no – apparently Dennis had a talker! I was fortunate enough to see a clip of the interview that Dennis conducted and I saw what he meant – in the 10 minutes of video, Dennis only had a chance to ask two questions! The most interesting part was simply talking with the students (I really should call them writers). They asked questions about how I write my blog and I asked them for advice as well! We talked about what it’s like to interview someone you don’t know and how long you wait between the interview and the writing. When they starting sharing stories about their interviews and reading their work, I could tell they were proud of what they were accomplishing. And the fact that they were sharing their ideas and worries with me – letting an outsider into their world – that was humbling for me. Had the situation been reversed, it would have been difficult for me to share my thoughts, stories and worries face to face with people I barely knew. In that respect, these young writers are braver than I am. I learned a lot from them. 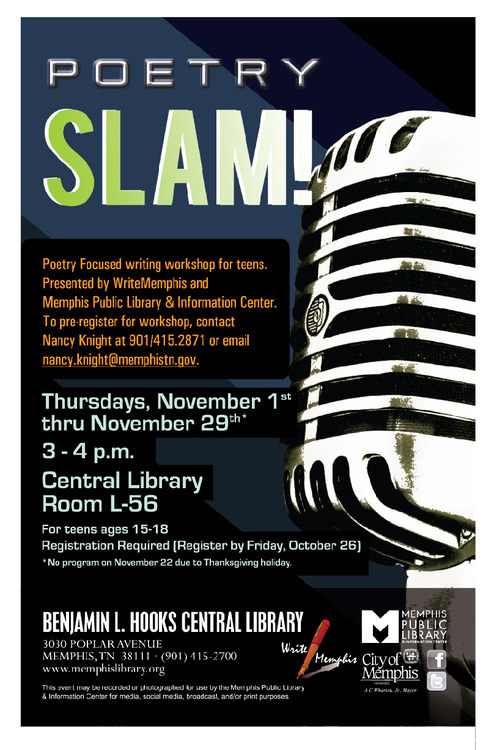 WriteMemphis creates a safe space for students to grow and develop their voice. In a world dominated by adults and rules, it gives them the freedom to experiment without fear of ridicule or criticism. Kristin Korneliussen has been working with these students for over a year and wants to show them that “writing can be powerful and fun. Writing is a totally different experience when you’re not being evaluated on it.” She also said she’s seen their confidence grow through this project. During the interviews, Kristin said she was proud to see the students take the lead and guide the conversations. To say I “volunteered” with WriteMemphis is not fair, because I have to admit that I learned more from the students than they did from me! You can volunteer with WriteMemphis even if you’re not a writing expert. They’ll pair you with an experienced instructor and give you the tools you need to help. If you have an interest in making students feel valued, this would be a perfect opportunity for you. Contact Emma Connolly emma@writememphis.org and she’ll help you find a place to make a contribution. Keep up with their great work by following their blog (It’s great!) and by following them on Facebook. Support their work! Read their poetry and essays, come to the Christmas play (original work of course) and definitely read the interviews and stories from the South Memphis Interview Project when they’re ready. Visit WriteMemphis for updates. Donate! Just $10 buys a month’s worth of writing supplies for 5 students. A $50 donation will sponsor 5 middle-school girls to attend Summer Writing Camp. This entry was posted in Uncategorized and tagged creative writing, creativity, interviews, poetry, poverty, students, teens, volunteering, writing. Bookmark the permalink. Thank you Sarah! What a great experience! Thank you for such kind words. I too attended one of the Poetry Slam session and really enjoyed the experience! I felt so in my element with being able to hear and share thoughts through writing with a diverse group of individuals. I’m looking forward to one day facilitating my own session….thank you Mrs. Emma for sharing the experience!